Insant Pot Rice. How To Make Perfect Instant Pot Rice. How To Make Perfect Instant Pot Rice every single time! 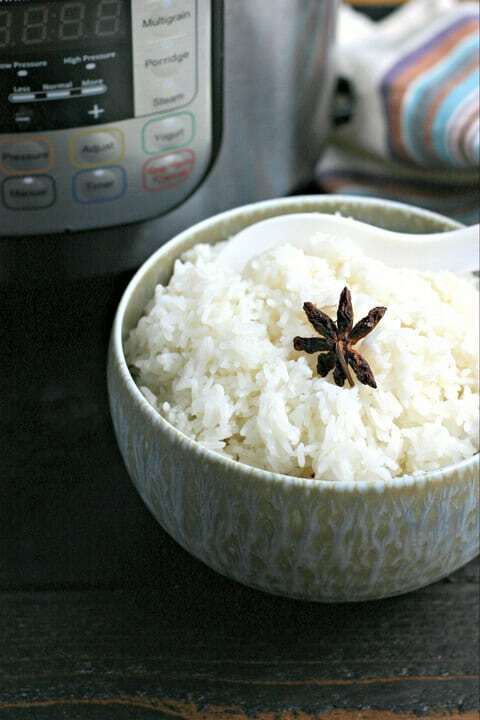 An easy tutorial for how to make perfect rice in the Instant Pot with just a bit of spices and oil. Hint: It’s all about the water:rice ratio! Anyone who has an Instant Pot knows that it is pretty much a magical kitchen appliance. I use mine almost every single day, whether it’s for hard boiled eggs, a quick pot of greens, dinner in a hurry, creamy 10-minute mashed potatoes or just for cooking staples like rice. I have to admit that when I first tried rice in my Instant Pot it was an epic failure. Mainly because I didn’t adjust the water:rice ratio and just hit the “rice” button. After a bunch of trial and error, I discovered that the secret to making amazing rice in the Instant Pot EVERY SINGLE TIME is the water:rice ratio and it’s really different than stovetop rice. I like to season my rice with a couple cracked cardamom pods, one star anise, some white pepper and a bit of salt. It smells amazing and the rice has the slightest hint of spice. It’s really wonderful with everything. But, if you keep the water:rice ratio the same and make sure to add a little bit of fat and salt, you could skip the spices (try it at least once with the spices!) if you just want plain rice. Is this only for Instant Pot White Rice? I have tried this technique with a few varieties of White Jasmine and White Basmati rice (medium and long grain) and all have worked really well. I have NOT tested this technique with brown rice. Does Instant Pot Rice freeze well? I have a 6-quart Instant Pot and always make a large batch of rice and then freeze a few containers for later in the week. It freezes and defrosts great and is perfect for things like Fried Rice or along dishes like my Creamy Paprika Chicken Skillet. If you want to make a meal, try Instant Pot Rice and Beans from my friend A Mindful Mom! How To Make Perfect Instant Pot Rice every single time! 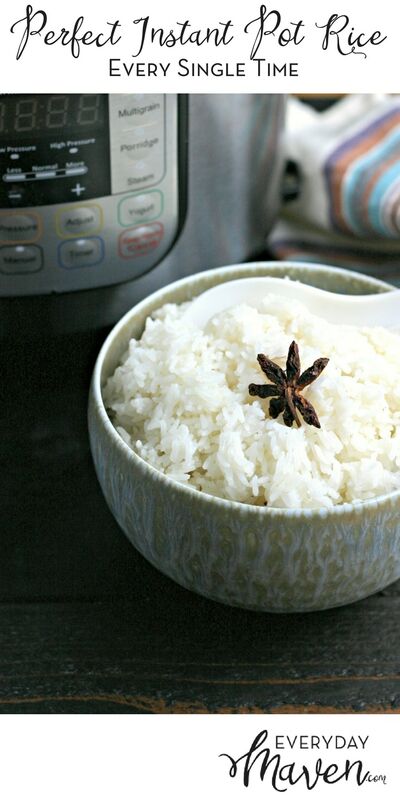 An easy tutorial for how to make perfect rice in the Instant Pot with just a bit of spices and oil. Hint: It's all about the water:rice ratio! Place rinsed rice into Instant Pot vessel and add filtered water, oil and spices. Stir to mix. Lock lid and make sure pressure cooker vent is set to "SEALED". Use "RICE" button or set to manual pressure for 12 minutes. Once done, allow to depressurize using the natural pressure release. If you are in a rush and want to do a manual pressure release, let it sit for at least 5 minutes first. Fluff rice with a fork, serve and Enjoy! Once cool, freeze for later. I’m hit or miss with cooking rice on the stove top, but your IP rice recipe worked perfectly for me!! Thank you! Hi! A little late to the game but I just came across this. How do you freeze your rice? And then how do you heat it up again without it being dry clumps of rice balls? Thanks so much for the recipe. I never thought of making a lot and freezing it. We are always waiting for the rice to finish to eat dinners. Excellent!!! Hi April! I scoop it into glass storage containers and allow to cool completely. Then cover and into the freezer! I usually just defrost one the night before and keep in the fridge. Are you using Basmati or Jasmine? I have found that Jasmine rice freezes and reheats better than Basmati! Will this recipe work with regular long grain white rice? As long as it is not par-boiled, it should! Hi Susan! I would give it a try with the rice button and see how it turns out! If it’s not cooked right, switch to manual and test it! Do you have the Lux? If you use manual, it’s LOW pressure for 12 minutes, right? That’s what the rice button does. If you cook it on high for 12, you’re going to get mush, in my experience. Tammy, 1/3 cup of dry rice makes about a cup of cooked rice. So you need 10/3 cups = 3-1/3 cups dry rice to make 10 cups cooked. Could I use ground cardamom? If so, how much? I make rice every week. Exactly as posted and turns out perfect. We make our own dog food and occasionally add rice and the pups love it too. Freezes perfectly. I have never cooked rice before, just learning how to cook. Did one cup in the IP and it surprised me that it was really good. Yay! Glad you liked it Dave! Thanks for this recipe! My rice was perfect! Did 3 cups rice and 3 cups water. Came out just as I like it. Sticky and flavorful! Used the Jasmine Rice. Oh and a little olive oil. I have the 6qt with 10 settings insta-pot. Try it, you’ll like it!. I just love my pot. I have had it for about 3 weeks now and use it all the time!!!! That is awesome Angie – so glad to hear it! i made it but with different ingredients used chicken broth and Italian seasonings with sausage came out perfect, good job beta testing. Yep – that should work! I have an IP Duo with a low pressure and high pressure option. With this recipe, do I do high or low with the rice setting? I can do either. Set it to “Rice” and it will automatically set the pressure for you! I’ve tried rice a couple times and it was okay, but looking forward to trying your recipe. I had a question though. I am wondering why I see so many different cooking times for people claiming to have the perfect rice recipe. Yours says 12 minutes, but I just read another that was only 3. Same kind of rice, same ration of rice to water. I will try both maybe, but wondering if you have experience with both cooking times to tell me the difference. I use boil in bag rice all the time, but maybe will do larger batches and freeze if this works well. Thanks for your response! Hi Matt! I am not sure – I have tested rice a lot of times and 3 min sounds totally unrealistic unless they are using a super short grain rice or par-boiled rice? Try mine exactly and see what you think! Probably a typo. No way would 3 minutes cook the rice. Maybe minute rice. I believe you are referring to manual mode on high pressure. That would be 4 minutes of cooking with a 10 minute natural release. If I ever buy an instant pot, I’m definitely trying this first! You won’t be sorry. It is the best gadget yet. I make yogurt once a week. Love it. Best corn on the cob ever and believe me I have cooked it every way imaginable. What’s the max capacity of a 6qt instant pot to cook rice? Hey Gladys! I have made 4 or 5 cups at a time!! I believe the owners manual states to fill only to the 1/2 mark on the vessel if making rice. I would think this is closer to her 3 cups, but I am not quite sure, and mine is pressurized with rice in it right now so I can’t check. Sorry. I substituted with 2 cups of water and 1 cup of orange juice. I take it that you are using a real 1 cup measure for the rice and not the plastic cup that came with the instant pot. Hi Carol — Yes – a real 1 cup measure! Carol – so glad you asked the question… I was confused because I know that it is not a full cup!! Ok, I’m not one to experiment with my rice. Especially since I was experimenting with lunch today. But holy moly, this rice was awesome! My mother was skeptical as well as I didn’t have time to hide the evidence before she got here, but she loved it as well! Thank you so much for this recipe, I’ll have to pick up some avocado oil for next time as I had to use olive oil today. I made this exactly except for 1 cup each of jasmine rice and water. I just happened to have whole cardamom pods and star anise. I used 1 star anise and 2 cracked cardamom pods. And a tsp of salt along with regular oil since I didn’t have any good oil. It was so good this way. Those spices added a little somethin-somethin! My 11 year old snarfed it down and he doesn’t like plain white rice. Make sure you rinse it as directed above. You need that extra water with a 1:1 ratio or it’d be crunchy. Hi Bonnie! Love it and so glad your 11-year old liked it – that’s the best!!! Hey Thomas – yes, the oil helps with that. I very rarely have sticking but the grain (jasmine, basmati, etc.) and type of rice (long, short, etc.) also play a big role! If you are having sticking issues, swirl the oil on the bottom and then add the rest of your ingredients. Hi Steven! I am not sure – I don’t use parboiled rice. Hi Steven, I just made some Carolina Gold in my Crock Pot Express. I used the recipe in the booklet (1 cup rice + 1.5 cups water) and did the 12 minute low pressure rice setting. I let it sit for 10 minutes natural release. I thought it was perfect! I tried 2 batches, one rinsed and one not rinsed. I honestly think I prefer the non-rinsed, but it might be a personal preference. It’s slightly firmer and has more flavor. I did see a demo saying that parboiled rice did not need to be rinsed, so I probably won’t bother. Hope that helps! I made this today, didn’t use any of the spices besides pepper.. only cooking for two so 3 cups of uncooked rice was waaaaay too much.. so cut it down to 1 1/2 cup of each… it did not turn out the best.. although it was mostly cooked and not crunchy. it still needed more moisture it seemed.. although i used warmed chicken broth so that may have been a bit of a difference since the recipe calls for cold water. What type of rice did you use? White? Brown? Long? Short? etc. Whats the max amount of cups do you think I can cook in my 6 quart instant pot? It is said that you should not fill the IP more than halfway with starchy things such as rice/pasta. So for a 6 Quart, you can do 3 Quarts of rice and water total. So 1.5 quarts of rice is 6 cups. I have never done this much rice, but I can imagine it would take longer to come to pressure and longer for the pressure to drop. Still the same amount of cooking time tho. Beware of foam coming out of the vent, you might need to really clean out the vent area afterwards so it doesn’t get all gummed up. Instant Pot rice is my fave! Great tips the spices too! I’ve been hearing wonderful things about the Instant Pot! Including that it’s a good ricing cooker. As with all things, it sounds like there’s a tiny learning curve. But it does sound like a good appliance, and a great way to make rice. Thanks! Awesome, This is perfect for cooking rice. great tip for brown rice – thanks Marlene! I keep saying it but I really do need one of these. You do – it is one of my most FAV kitchen appliances! I don’t have an instant pot. But am intrigued 🙂 Love that you add avocado oil to the rice… it’s my current fav! I love to use avocado oil! I’ve had a instant pot for a few years now. But have never even tried cooking rice in it. I have always cooked it in a pot on the stove. That’s how my mum cook it so I just followed suit. Yay – so happy to hear it was perfect! This is my fav way to prepare rice and I even have a fancy pants rice cooker (that is collecting dust). Love the lemon peel addition – I’ll try that next time Thanks Peter!